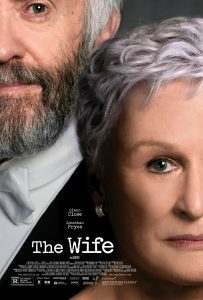 “The Wife” (2017 production, 2018 release). Cast: Glenn Close, Jonathan Pryce, Christian Slater, Max Irons, Elizabeth McGovern, Harry Lloyd, Annie Starke, Alix Wilton Regan, Karin Franz Körlof, Nick Fletcher. Director: Björn Runge. Screenplay: Jane Anderson. Book: Meg Wolitzer, The Wife. Web site. Trailer. Famed, best-selling author Joseph Castleman (Jonathan Pryce) is on the verge of the biggest accomplishment of his storied career. As a candidate for the Nobel Prize in Literature, he nervously awaits word from the awards committee beside his ever-supportive wife, Joanie (Glenn Close), who has spent many years dutifully attending to his every need. And, when word finally arrives that he’s been named the winner, he’s ecstatic. However, the same can’t be said for Joanie. Sure, she puts on a smiling face, but, somewhere amidst all the celebrating, she just doesn’t seem to share in her husband’s happiness. The question, of course, is why. 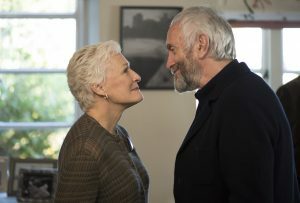 Best-selling author Joseph Castleman (Jonathan Pryce, right) and his dutiful wife, Joanie (Glenn Close, left), prepare to celebrate his win of the Nobel Prize in Literature in the new domestic drama, “The Wife.” Photo by Graeme Hunter, courtesy of Sony Pictures Classics. As the couple prepares to head to Stockholm, Sweden for the awards ceremony, Joanie’s mood grows ever more perplexingly dour. And the more her celebrated spouse is thrust into the limelight, the harder it is for her to contain her feelings, which gradually surface as part melancholy, part resentment and part rage. But what’s behind these emotions? For what it’s worth, that begins to emerge, too, thanks to the increasingly inquisitive and intrusive questioning of her son, David (Max Irons), and of an ambitious would-be biographer, Nathaniel Bone (Christian Slater), both of whom accompany Joseph and Joanie on their trip. In quiet moments between the festivities, Joanie turns reflective, thinking back to the days when she first met her future husband while she was his creative writing student at Smith College. Through a series of flashbacks, viewers discover how a young Joanie (Annie Starke) and a young Joseph (Harry Lloyd) came together. Details of their romance and of their respective literary aspirations are revealed, aspects of which helped forge and fuel the feelings that Joanie is experiencing now. The question is, can she handle the revelations that are finally breaking through and demanding attention? And, perhaps even more importantly, what implications will they carry as she and Joseph look to move forward with their lives? 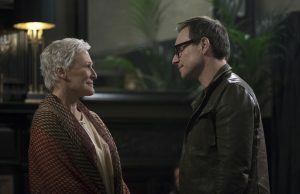 Ambitious, would-be biographer Nathaniel Bone (Christian Slater, right) aggressively tries to coax information about a Nobel Prize-winning author from the writer’s wife, Joanie (Glenn Close, left), in director Björn Runge’s new domestic drama, “The Wife.” Photo by Graeme Hunter, courtesy of Sony Pictures Classics. Joanie’s reflection process deals with many issues, but it principally focuses on her motivations, the reasons underlying what she does and did. This is essentially the same practice we engage in when we employ the conscious creation process, the means by which we manifest the reality we experience through the power of our thoughts, beliefs and intents. It can be a trying process, especially if we come up against motivations that we were unaware of, particularly if they involve matters we dislike. It can also be disheartening, exasperating and troublesome if we had been engaged in such practices for a protracted period of time. Thoughts of wasted efforts, foolishly expended energy and other worrisome concerns come to the forefront. And it’s those issues that Joanie must now face front and center. For instance, as a creative writing student, Joanie obviously had a love of the craft. And, from all indications, based on the glowing feedback from her professor-turned-spouse, she had real talent. Yet, from all appearances, she simply walked away from it, without hesitation, seemingly because of the discouraging advice she received from author Elaine Mozell (Elizabeth McGovern), a prolific and gifted but commercially unsuccessful writer who told Joanie that women couldn’t cut it in the male-dominated publishing industry of the late 1950s. So why did Joanie cave? Fear of failure? A desire to spare herself the kind of frustration that Ms. Mozell endured? Or did she instead decide to refocus her efforts on being a devoted wife and mother? But was the domestic life enough for someone who obviously had so much to say? And now, years later, seeing Joseph experience such success, can she live with her past decisions? Philandering author Joseph Castleman (Jonathan Pryce, right) takes a liking to a photographer (Karin Franz Körlof, left) assigned to document his receipt of the Nobel Prize in Literature in the new dramatic release, “The Wife.” Photo by Graeme Hunter, courtesy of Sony Pictures Classics. As becomes apparent, though, such considerations ring hollow. There’s more to the feelings that are now surfacing, and they suggest that she’s been concealing some bigger, even more troubling secrets for decades, revelations that she can no longer contain. What is she to do with them as she struggles to keep a lid on them that will no longer stay in place? Then there’s also Joanie’s relationship with Joseph. As the flashbacks reveal, she fell for her future husband rather easily – while he was already a married man and father of a young daughter. Were they truly in love and destined to be together, or was she an impressionable young admirer who took advantage of an opportunistic situation? And, if the latter, can she realistically live with that? What’s more, after many years together, it became apparent that Joseph was a serial philanderer, pursuing affairs without being especially discreet about them. This penchant even follows the couple to Stockholm, where Joseph engages in a less-than-veiled flirtation with a photographer (Karin Franz Körlof) assigned by the Nobel Committee to document his time in Sweden. This is another consideration that Joanie must wrestle with. Best-selling author Joseph Castleman (Jonathan Pryce, center) gives thanks for winning the Nobel Prize in Literature at a banquet in his honor in “The Wife.” Photo by Graeme Hunter, courtesy of Sony Pictures Classics. On top of all this, Joanie must consider her feelings about the way Joseph treats David, an aspiring author in his own right. As a protective mother, she’s naturally concerned about her child’s feelings. This instinct is particularly strong, given that she can see the talent that her son possesses, something that Joseph tends to dismiss out of hand. His hypercritical assessment of David’s work clearly eats away at the younger Castleman, and Joanie is troubled by this, seeing Joseph’s heavy-handed scrutiny as unduly harsh. She can’t help but wonder if her husband feels threatened by their son’s talents and if his scornful treatment is legitimate criticism or perverse jealously. In light of that, then, she begins to question the respect she holds for Joseph. Can she genuinely continue to support him the way she has for so many years? Joanie’s introspection on these issues is a lot to bear, especially in the shadow of all the praise being heaped on a man she’s beginning to have serious doubts about. The questions raised by David and Nathaniel exacerbate this process, too, as if they’re prodding her into accelerating her scrutinous activity. It’s as if she’s intentionally drawn these taskmasters into her existence to keep her on track, to push her to continue the process of evaluating motivations she’s long kept at bay. Indeed, the process is difficult, but it also has the potential to pay significant personal dividends. For example, it holds the promise of facing fears and prompting Joanie to live courageously, perhaps for the first time in decades. It also makes it possible to unearth some long-buried personal integrity, enabling her to openly be her true self, again for the first time in ages. These are significant personal gains not to be minimized. 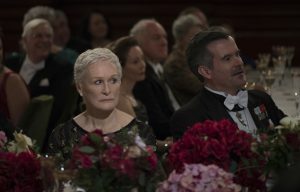 In a moment of panic and realization, Joanie Castleman (Glenn Close, left) comes to understand her true life purpose during a conversation with King Gustav of Sweden (Nick Fletcher, right) in the new domestic drama, “The Wife.” Photo by Graeme Hunter, courtesy of Sony Pictures Classics. But, perhaps most importantly, Joanie’s motivation assessment enables her to see clearly her true purpose in life, perhaps for the first time. 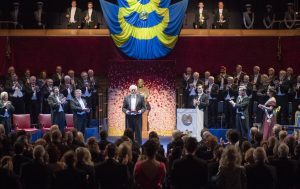 This becomes apparent at a banquet honoring the Nobel recipients in which the presenter of the awards, His Royal Highness Gustav of Sweden (Nick Fletcher), speaks of his “job” as king, after which he asks Joanie if she, too, has a job of her own. After an extended, reflective pause, she waxes poetic with a response that she indeed has a job – that of kingmaker. Yet, even with such a frank, insightful acknowledgment – a realization that she has perhaps come to for the first time in her life – there’s a certain discontentment with her own answer, suggesting that her evaluation of her motivations is still incomplete, that she must continue to dig deeper into the amalgamation of thoughts, beliefs and intents that has shaped her reality as it has materialized – and to decide if she wants to keep manifesting it the same way that she has throughout all that time. For all of the film’s many worthwhile metaphysical strengths, though, there are aspects of the picture that come up short. The biggest issue is the story’s predictability, some of which is apparent even in the trailer and the remainder of which tends to become fairly obvious early on in the movie. This lack of suspense consequently undermines a plot where there should have been intrigue aplenty. What saves the film from this innate shortcoming, however, is the power of the performances by Close, Pryce and Slater, all of whom are outstanding in their respective parts. In fact, this could be the role that finally earns Close her long-overdue Oscar, considering that she shows a range here not previously apparent in most of her other performances. If strong portrayals and philosophical insights are enough for you, by all means see this one, but, if you find formula story lines tiresome, you might want to skip this release. Motivations can be tricky to deal with, because we can convince ourselves to turn a blind eye toward them, especially if we’re afraid of what we might see. But, nevertheless, they’re always with us, like companions for the journey. So, if we’re to make the most of our trip through life, we should pay attention to what they are and what they’re intended to achieve. To do less is to face a lifetime of disillusionment and disappointment, the makings of a tragedy far more troubling than anything even the most talented novelist could ever conceive.